Malcolm DeMille is once again honored to create unique Prizes for the PGA Tour event, the Zurich Classic of New Orleans. 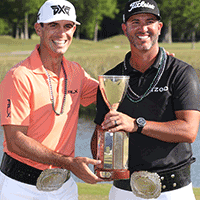 The winning team, Billy Horschel and Scott Piercy, each took home an eye-catching 6” rhodium plated belt buckle featuring the Zurich Classic logo. The impressive buckle also embodies the spirit of New Orleans with details such as music notes, fleurs-de-lis, gators, and Mardi Gras masks.